Brief Synopsis: Maxwell Lord tries his hand at being a super hero. 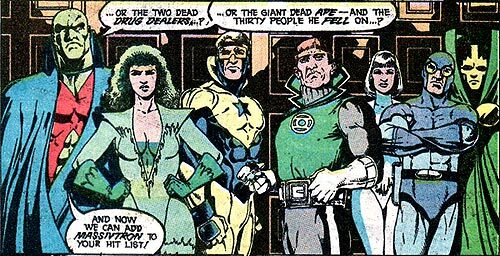 In Maxwell Lord's dream, Booster Gold is seen among the Justice Leaguers in the New York Embassy defeated by Massivtron, "the League's arch-foe!" Martian Manhunter, Fire, Booster Gold, Guy Gardner, Ice, Blue Beetle, and Mister Miracle stand accusing Maximum Force of multiple murders. 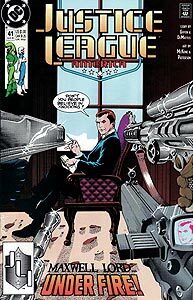 Maxmimum Force is the heroic alter-ego of Maxwell Lord. This is Booster's last appearance in this issue.